It is PPG’s view that pets need to be well-socialized and mentally and physically healthy if a productive and safe relationship for all members of their family and the public at large is to be ensured. As such, PPG urges all parties involved in determining new legislation to focus first on education, operational standards and modern, humane methods. Governments have a responsibility to implement effective public health measures that increase the information available to the public and decision-makers, protect people from harm, promote health, and create environments that support healthy behaviors (Friedman, 2010). If you have a marvelous mutt or mixed breed you need to read this – Veterinarian Dr. Karen Becker discusses a recent experiment which assessed a person’s ability to identify which breeds make up a mixed-breed dog based on the dog’s appearance. The guesses made by the 10,000 study participants were then compared to DNA tests for the dogs. The guesses were accurate only 25% of the time. It is rare that there will be witnesses to the breeding which results in mixed breed puppies. Therefore, when these puppies or adult dogs end up in a shelter or rescue, they will be labeled with a breed or mix of breeds based on their appearance. Based on this recent study, as well as other studies, it is very likely that the label will be entirely wrong. For this reason, many shelters are no longer guessing a mutts lineage and are just labeling them according to size and color. To me that makes sense, as people often have expectations about a dog’s temperament and behavior based on that breed label, and since it is wrong, may end up disappointed. 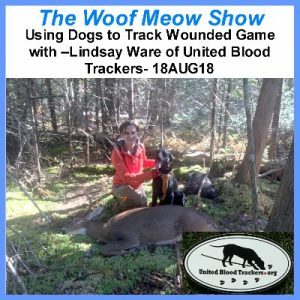 In this episode of The Woof Meow Show from August 18th, 2018 Kate and Don have a conversation with Green Acres Dog Training Instructor Lindsay Ware about her work with her dogs Gander and Aldo and United Blood Trackers. Lindsay discusses how she has trained her dogs to help hunters recover wounded game such as bear, deer, and moose. We also talk about why this conservation work is so important. Lastly, Lindsay shares some stories about Gander and Aldo’s more exciting searches. 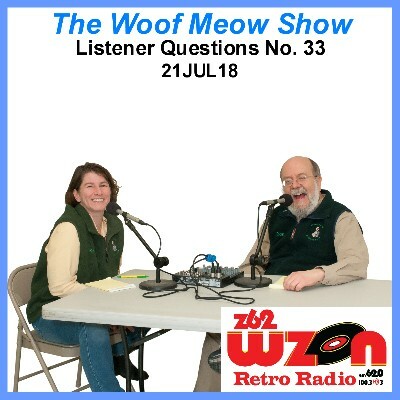 You can hear The Woof Meow Show on Z62 Retro Radio, AM620, and WKIT HD3 at 9 AM on Saturday. If you are not near a radio, listen on your computer at http://www.wzonthepulse.com or your smartphone or tablet with the free WZON 620 AM app. A podcast of the show is typically posted immediately after the show and can be downloaded at www.woofmeowshow.com and the Apple iTunes store. 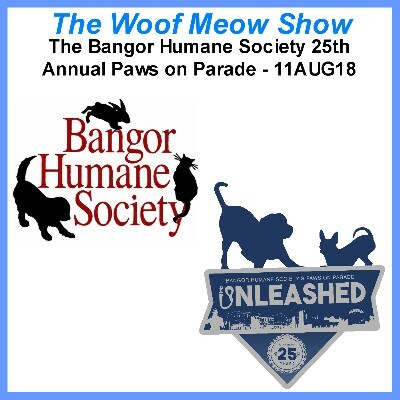 In this episode of The Woof Meow Show from August 11th, 2018, Kate and Don talk with Suzan Prendergast and Stacey Coventry from the Bangor Humane Society. We discuss the history of NHS, its mission, and what’s been happening over the past year. Stacey also tells us about the newly revamped Paws on Parade, a BHS fundraiser and equally importantly, a celebration of pets and people brought together through BHS. Lastly, you will learn how you can get involved in this great event and help BHS reach their goal of raising $100,000. 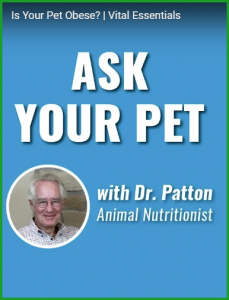 Shared Blog Post – Ask Your Pet with Dr. Patton – Is Your Pet Obese? 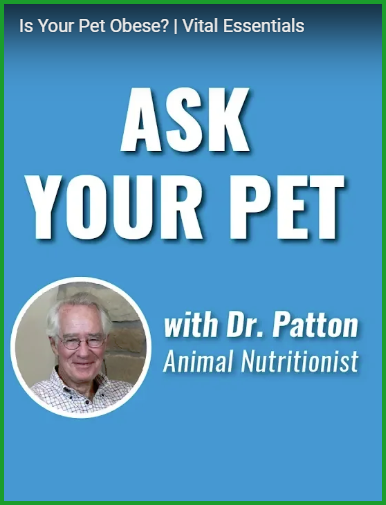 Our friends at Vital Essentials have started a new video and blog series with Dr. Richard Patton, author of Ruined by Excess, Perfected by Lack and one of my favorite resources on pet nutrition. The first in this series addresses pet obesity. In this post from 18AUG18, Veterinarian Dr. Karen Becker discusses the latest marketing practice by some pet food companies; the hyping of “Clean” ingredients. While that may sound like a good thing, because of the lack of a legal definition of the term “Clean ingredients” puts this in the category of just more misleading marketing hype. The processed pet food industry is increasingly at a loss to understand how to keep pet parents happy and buying their products. The industry touts the self-funded “science” behind their pet food, but laments that consumers don’t trust it. Unless big pet food aligns its goals with those of pet parents, it will continue to lose ground as consumers find alternatives to processed diets. When we put our dogs into new situations, they often divert their attention away from us and toward anything and everything but us. Sometimes they even get a little over-enthusiastic or what some people consider CRAZY. One example of this is the dog in a training class that is more attentive to the instructor than the person they live with 24/7. Students often attribute this to a mystical ability only found in dog trainers, but it comes down to something much simpler. The dog trainer, provided they are reward-based and pleasant, is also often more interesting than you merely because they are novel and different. Remember, living with you 24/7 leads to a sense of familiarity which can cause, no offense intended, boredom (yawn!). I understand why you want your dog to learn self-control, especially in public situations. To get focused, undistractable behavior you need first need to understand why you may not be able to hold your dog’s attention. Your dog is young and well socialized. – Remember when you were young and carefree? Every new thing you experienced was exciting and an excuse to have some fun. Young dogs can be much the same way, especially if you did a good job socializing and habituating them so that they are not fearful. Pat yourself on the back and let your dog enjoy the moment because you will be sad the day they lose that enthusiasm. Your dog is insufficiently trained for the situation in which they have been placed. If you have attended a dog training class, hopefully, you have learned that dogs do not generalize well. In fact, if you teach your dog the sit behavior to pure perfection, but only train your dog in your kitchen, your dog may be clueless if you cue them to sit in the living room or at a park filled with novel distractions. Dogs need to learn a behavior in a wide variety of environments and situations before you can expect them to respond to a cue in almost any situation. I am not just talking about teaching your dog in various spaces but also around a wide variety of distractions. Also, recognize you need to do this in small increments. Just because your dog will sit in front of one motionless child that they know does not mean they will sit in front of seven children they do not know that are running around erratically while giggling. Reinforce the bond you have with your dog on a regular basis, train them with rewards and fun to respond in the environments that they will experience, keep them out of stressful situations and be patient. Do these things and your dog will focus on you. Don Hanson is the co-owner of the Green Acres Kennel Shop ( greenacreskennel.com ) in Bangor where he has been helping people with their pets since 1995. He is a Bach Foundation Registered Animal Practitioner (BFRAP), Certified Dog Behavior Consultant (CDBC), Associate Certified Cat Behavior Consultant (ACCBC) and a Certified Professional Dog Trainer (CPDT-KA). He produces and co- hosts a weekly radio show and podcast, The Woof Meow Show heard on AM620 WZON and streamed at http://www.wzonam.com/ every Saturday at 9 AM. Podcasts of the show are available at http://woofmeowshow.libsyn.com/. Don also writes about pets at his blog: www.words-woofs-meows.com. He is committed to pet care and pet training that is free of pain, force, and fear. The opinions in this post are those of Don Hanson. In a recent interview, I was asked a series of questions about how to choose a dog trainer. One of the questions was “What would you like to have known when you started training dogs?” This post will be the first of a series of article inspired by that question. In the spring of 1991, I had a new 12-week old Cairn Terrier puppy named Gus. I had no knowledge of dog training, but a desire to learn. I started to learn by reading two of the most popular dog training books at the time; How to Be Your Dog’s Best Friend and Mother Knows Best. The basic premise of both books was that a dog is a wolf and the best way to train and care for a dog is to dominate it like an Alpha wolf would dominate a wolf pup. My wife and I also enrolled ourselves and Gus in a puppy kindergarten class offered by the local dog club. Our first night in puppy class was a complete disaster. I was told to command Gus to sit, and Gus failed to comply. Now, this was not a big deal to us nor a surprise, as we were well aware that Gus had no clue what we wanted him to do when we said the word “Sit.” However, Gus’ failure to comply was a massive deal to the two instructors. They told me, in no uncertain terms, that Gus was exerting his dominance and that I had to alpha roll him to show him that I was the Alpha. The alpha roll was precisely what the books we were reading recommended, so not knowing any better I did as I was told. As I grabbed Gus by the scruff and pinned him, he immediately began thrashing around underneath me, growling and snapping, and trying to connect his teeth with me, so that I would let him go. I know now that Gus was terrified but at the time believed I was doing the right thing. The instructor now became even more adamant: “We can’t have that! Grab his muzzle and clamp it shut!” My instincts said “Whoa! That’s not safe!” but these people were the “experts” so I tried grabbing Gus’ muzzle in my hand. Instantly, I felt his canines puncture my palm. As my blood started dripping on the floor, Gus broke free and moved as far away from me as he could. There is something to be said for listening to your gut instincts. Gus followed his; I failed to pay attention to mine. Unbeknownst to me at the time, everything that I had read and been taught about the alpha wolf rollover was based upon flawed knowledge. 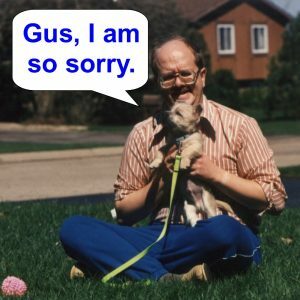 My puppy was afraid for his life, and it was my fault. When we got back home, it was evident that the relationship between Gus and I was severely damaged. I was no longer being asked to “throw the ball” by the puppy with the joyously vibrating tail. Gus did not trust me, and I did not trust him. Over many months Gus and I learned to trust one another again, and training and behavior became something we both enjoyed. We were fortunate to discover Dr. Patricia McConnell where we learned about the wonders of reward-based training. We had fun; our dogs had fun and that should be a primary focus of training. So this is what I would have liked to have known before I started training Gus. Just because something is in a book written by an alleged expert does not mean it is good advice or even factual. The study of wolf packs in the wild has taught us that a wolf pack is a family working cooperatively to survive to pass on their genes. Their survival depends on cooperation, NOT competition to be the alpha within the pack. The violent alpha roll described in the books I read has never been observed happening in a wolf pack. A wolf pup may voluntarily roll on its back and submit to an older wolf, but it is never physically forced to do so. The entire concept of dominance is not only an erroneous understanding of the dog-human relationship, but it is also counterproductive to a harmonious relationship with our dog and may cause aggression as it did with Gus. Unfortunately the same bad advice I received in 1991 is still being promulgated today, in spite of the fact that major canine organizations such as the American Animal Hospital Association (AAHA), the American Veterinary Society of Animal Behavior (AVSAB), the Pet Professional Guild (PPG), the Association of Professional Dog Trainers (APDT), all warn of the use of dominance-based training. Dogs: A New Understanding of Canine Origin, Behavior and Evolution, Raymond and Lorna Coppinger, University of Chicago Press, 2001. Dominance: Fact or Fiction, Barry Eaton, 2002. Dominance Theory and Dogs Version 1.0, James O’Heare, DogPsych Publishing, 2003. Don’t Shoot the Dog – The New Art of Teaching and Training (2ndedition), Karen Pryor, Bantam Books, 1999. On Talking Terms With Dogs: Calming Signals, Turid Rugaas, Dogwise Publishing, 2006. Stress in Dogs, Martina Scholz and Clarissa von Reinhardt, Dogwise Publishing, 2007. The Culture Clash, Jean Donaldson, James & Kenneth Publishers, 2005. The Power of Positive Dog Training, Pat Miller, Howell Book House, 2001. 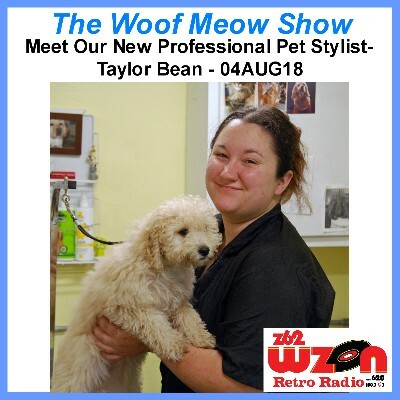 In this episode of The Woof Meow Show from August 4th, 2018, Kate and Don chat with Green Acres’ new Professional Pet Stylist, Taylor Bean. We discuss when Taylor first decided she wanted a career with animals, the pets she had growing up and has now, how she trained to be a groomer, what she likes best about grooming and more. Tune in and learn more about why Taylor should be grooming your dog! You can hear The Woof Meow Show on Z62 Retro Radio, AM620, and WKIT HD3 at 9 AM on Saturday. If you are not near a radio, listen on your computer at http://www.wzonthepulse.com or your smartphone or tablet with the free WZON 620 AM app. A podcast of the show is typically posted immediately after the show. You can download this show and others at www.woofmeowshow.com and the Apple iTunes store. What do we need to consider when we bring our pets along on vacation? How do I become a dog trainer? My dog has become aggressive. What kind of training will help? I am thinking about rescuing a dog and have been told that they have a high prey drive and have been told by the rescue that anything with fur and under 25lbs would be considered prey. What should I think about before adopting this dog? My dog seems bored, what can I do? Does my cat need to be groomed? Is grain-free food really necessary? 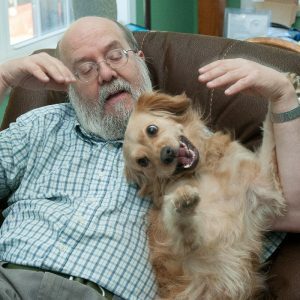 Selecting A Pet Care Provider – How to choose a dog trainer – http://hwcdn.libsyn.com/p/3/d/7/3d7b38ff509d64e6/WoofMeowShow-2017-01-07How_to_Choose_A_Dog_Trainer.mp3?